The Clear Make-Up Organizer is a transparent storage for cosmetics and make-up. Made of high-quality acrylic and because of its different compartments, the cosmetic box is the perfect tool for storing and presenting your collection of make-up items. The Clear Box by Nomess offers different compartments in which different kinds of cosmetic and make-up equipment find their place. The small compartments are reserved for lipstick, lip gloss and further lip care products, targeting a big smile on your lips. The tall compartments are perfectly suitable for collecting brushes for blusher or make-up. Matching powder, foundation and eye-shadow can be placed on the shelf space. Remaining compartments can be used for hand lotions, hair ties, a pair of pincers or perfume. With the Clear Make-Up Box by Nomess, make-up and further care products are well-organised. The perfect tool for the bathroom or vanity table. 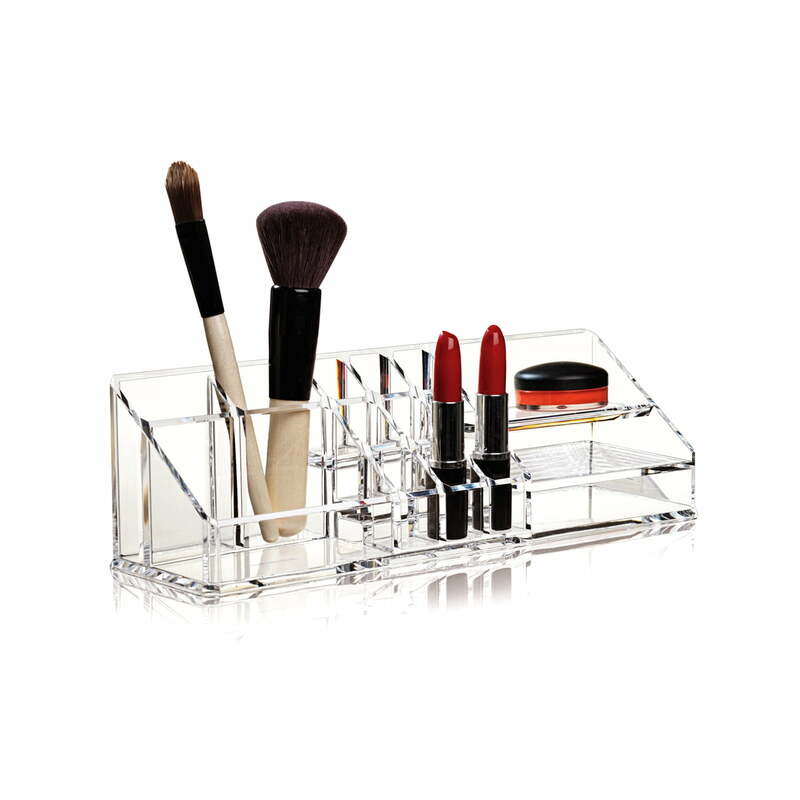 Single image of the transparent Clear Make-Up Organizer in XL made of acrylic by Nomess. The make-up collecting box has a length of 32 cm, a height of 9 cm, a depth of 21 cm and offers many single compartments. 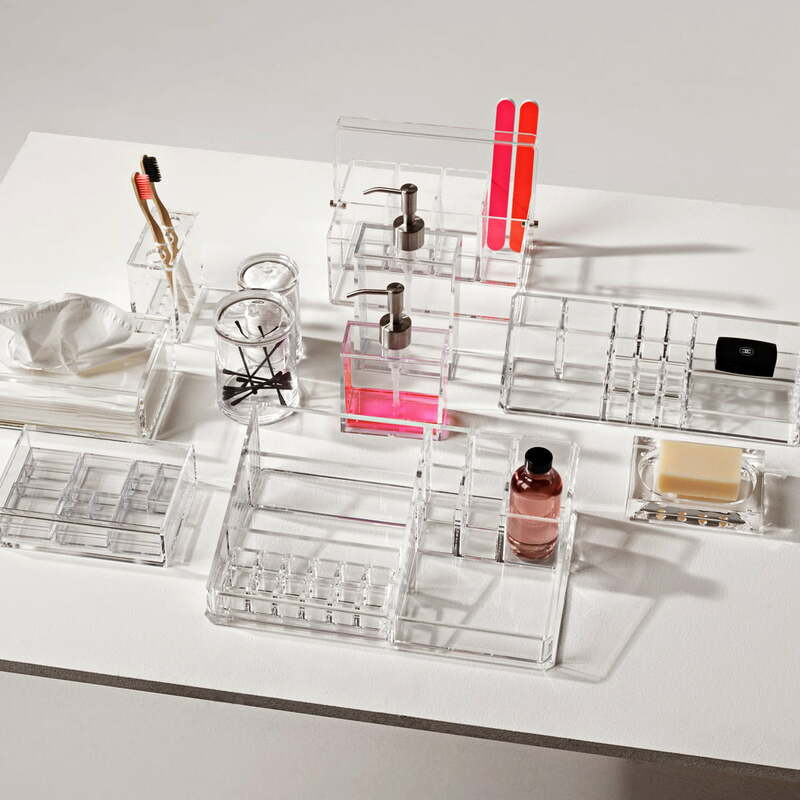 Single image of the transparent Clear Make-Up Organizer made of acrylic by Nomess. The make-up collecting box has a length of 30 cm, a height and depth of 9 cm and offers many single compartments. 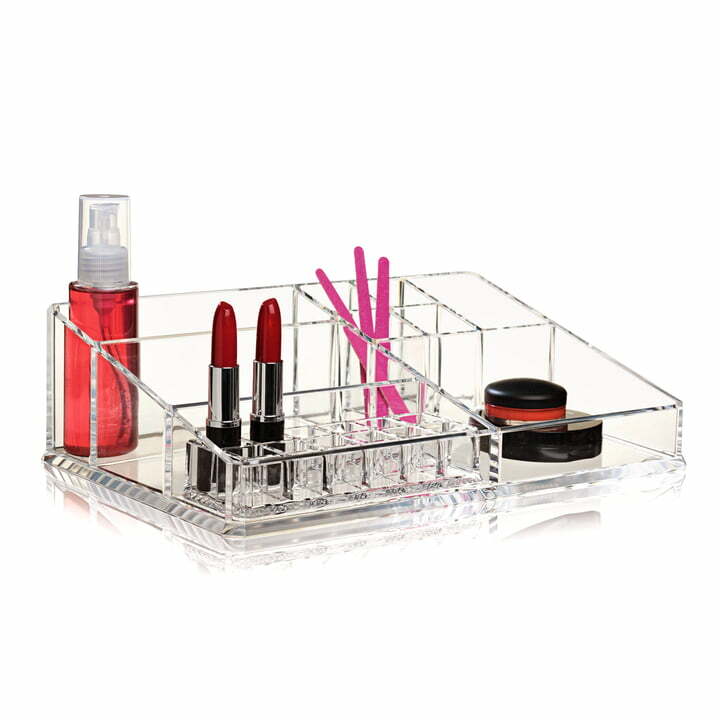 With the acrylic bathroom products by Nomess like the Clear Twin Organizer, Clear Make-Up Organizer, Clear Tool Box and the Clear Toothbrush Holder, design is brought to the bathroom. The storage boxes stylishly present bathroom accessories.